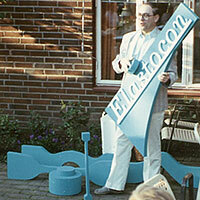 Elastocon was founded in 1987 by Göran Spetz, who was then working at SP Technical Research Institute of Sweden as a research engineer. After two years in the family garage, Elastocon moved to a location in Borås. The first product was a system for measuring stress relaxation developed when ISO TC 45 developed the test method ISO 3384. The second product was a cell ageing oven developed for precise heat ageing and testing of stress relaxation at elevated temperatures. The third product was a fogging tester for the determination of windscreen fogging in vehicles. 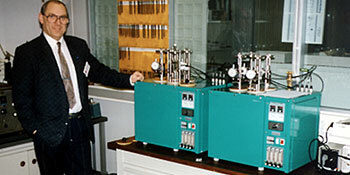 After that Elastocon has developed about 80 new products from compression set rigs to automatic computerised instruments such as the TR-tester. 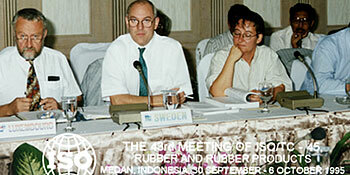 Göran Spetz has participated in the standardisation of rubber test methods since 1978 in the Swedish Rubber Standard Committee. He is now the Chairman of the Committee and a Swedish delegate in ISO TC 45 and convener in three working groups. This has given the company a lot of input and ideas for making testing instruments. The objective of Elastocon is to manufacture instruments giving more reliable results than other instruments for existing test methods and to develop new instruments for new test methods, for rubber and plastic materials.